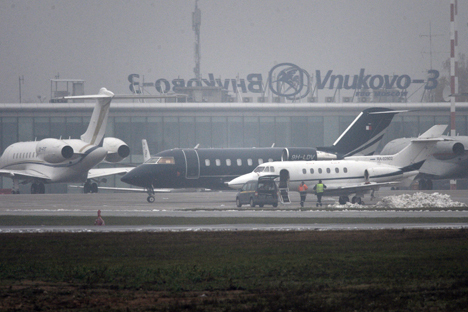 The Falcon business jet crashed at Moscow's Vnukovo airport in 2014. The Interstate Aviation Committee (IAC) has completed an investigation into the crash of a Dassault Falcon 50 jet at Vnukovo International Airport in Moscow in 2014. The Falcon jet, operated by France’s Unijet company, collided during the takeoff on Oct. 20, 2014 with a snowplow that caught fire and crashed on the runway, killing Total CEO Christophe de Margerie and three crewmembers, all of them French citizens. The fatal crash had been caused by a combination of 16 factors detailed by IAC in the final report published on the organization’s website on Oct. 25. The IAC oversees the use and management of civil aviation in the Commonwealth of Independent States (CIS). "The accident occurred at nighttime under foggy conditions while the aircraft was taking off after cleared by the controller due to collision with the snowplow that executed runway incursion and stopped on the runway," the IAC said. Among the factors behind the crash was the "lack of proper supervision from the airdrome service shift supervisor, alcohol detected in his organism, over the airfield operations: no report to the ATM or request to the snowplow driver as he lost visual contact with the snowplow," it said. The IAC also noted the "design peculiarity of the Falcon 50EX aircraft (the nose wheel steering can only be controlled from the LH seat) resulting in necessity to transfer aircraft control at a high workload phase of the takeoff roll when the FO (seated right) performs the takeoff." The criminal case into the crash is heard by the Solntsevsky court of Moscow. The persons in the defendants’ dock include Vnukovo aerodrome engineer Vladimir Ledenyov, snowplow driver Vladimir Martynenko, flight controller Alexander Kruglov, Vnukovo air traffic control head Roman Dunayev and taxiing controller Nadezhda Arkhipova. They are pressed with charges under part 3, article 263 of the Criminal Code of Russia ("Violation of Air Transport Safety and Operation Rules Entailing the Deaths of Two or More Persons by Negligence"). The article carries a punishment of up to 7 years in prison.